But statistics on the supply side — or the skilled workers that function as the backbone of the industry, ensuring productivity and driving economic success — illustrate the opposite. When asked in a study by the Associated General Contractors of America what the biggest concern to their business was, 41 percent of contractors listed workforce shortages. In another survey released by AGC, 70 percent of construction firms reported they were having a hard time filling hourly trade positions (including electricians, carpenters, tile layers, etc., and otherwise known as the bulk of the construction workforce). The reasons for the skilled worker shortage are clear — and numerous: the recession a decade ago forced labor to leave; younger generations are disinterested in trades work; available trade and technical education has been phased out; an aging workforce has retired; and the large pool of immigrant labor has been reduced. What these reasons overarchingly point to is a solution rooted in changing the image perception of the construction careers and revising the narrative about what pursuing a profession in the trades is like. 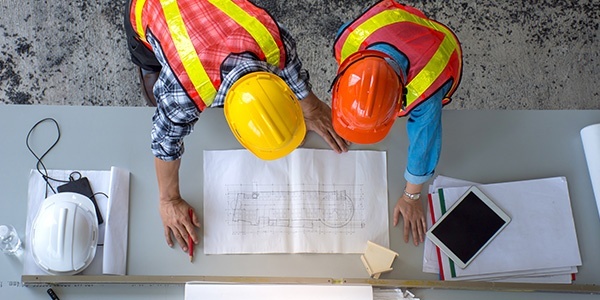 According to an International Journal for Research in Vocational Education and Training study, implementing change in the industry’s “marketing of building trades from menial to meaningful” is one of the strategies needed to reverse declining workforce trends. And, few industry stakeholders are as uniquely suited to do so as building products manufacturers. Rethink the “blue collar” image. Since the 1990s, vocational and technical training in the trades has slowly been phased out, as the emphasis has switched to advancing academic education and preparing students for college. The push for white-collar careers created a perception that there was a better career path providing higher income and status, stripping away programs that created opportunities for entering the trades. Careers in construction began to be considered low-paying, backbreaking, unsafe and with few opportunities for advancement. Today, that’s not the case. Strict regulations in safety, wage hikes, above average median incomes, and numerous training and promotional opportunities have been put in place by trade organizations, firms, unions and other stakeholders. What’s needed is a reimagining and evolved portrayal of what the linemen and their professions looks like. All industry stakeholders need to stake a claim in reviving the reputation of tradespeople by re-educating society, especially parents and educators, about the benefits of careers in construction in order to attract younger generations beginning to enter the workforce, and portraying them positively. Building product manufacturers should avoid illustrating construction tradespeople as those engaged in “dirty jobs,” and perpetuating the idea that it’s a lower-class profession. Improve the image of tradespeople by depicting them in your products’ marketing material in a capable, respectable and positive way. One of the strategies for addressing the construction labor shortage must include recruiting across all demographic groups. Because of stereotypes around the trades, little outreach or recruitment, and a lack of awareness, many women dismiss or have never considered construction as a viable career option. It’s no surprise they’re underrepresented in the market, with women making up less than 5 percent of all construction tradespeople. Interestingly enough, however, the construction trades are actually where the gap between women and men is far narrower, with tradeswomen earning on average 96 cents for every dollar men earn (compared to 81 cents for every dollar in the economy as a whole). Brands must engage women, speaking to them across marketing mediums and platforms, and refocusing marketing material and imagery to showcase the importance of women in the trades. Empower women to join the ranks of skilled workers by promoting the work they’re currently doing. Create campaigns inclusive of and targeted to females to build confidence amongst the young, talented generations of women entering the workforce. Today, technology is the most sought-after industry for Millennials and Generation Z, who will make up 20% of the workforce by 2020. These generations, who grew up with mobile phones and are considered to be the most tech-savvy ever, also view construction careers as being too physically demanding. In order to capture their attention, the image of the traditional construction jobsite needs to change. The worksite and its components look markedly different today than they did even five years ago as new technologies, devices and digital equipment enhance and replace traditional construction machinery and tools. The image of a worksite with a digger in dirt and a worker with a hammer veil the advancements that have been made in high-performance construction equipment, robotics and automated technology. Trades that rely on digital devices, drones, GPS, BIM, 3D printing, lasers and more should be depicted and communicated as such. By incorporating the digital components of the construction worksite today into imagery, marketing can convey its increasing use of information technology and better attract younger generations. To address the construction labor shortage, all industry stakeholders should become a part of the solution in rebranding the perception of skilled trades professions in the U.S. as lucrative, satisfying occupations that are as important, equal, and rewarding as all others. Learn more about how building product manufacturers can help ease the burden of the skilled labor shortage.